Did you know that some of the safest places in the world to drive are Germany, Sweden and the United Kingdom? But what about the United States? Although the U.S does not have the worst driving safety standards, the country still has much work to do in order to make its roads safer! When understanding road safety, there are many factors that must be taken into consideration such as: road conditions, income levels and drivers education. The countries with lower safety standards for driving tend to be in Central America, the Northern part of South America, Africa, the Middle East, and Asia. 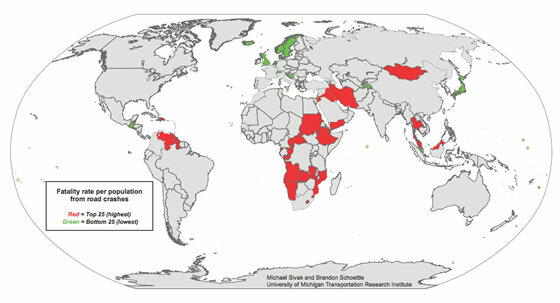 The countries with higher safety standards for driving tend to be primarily in Northern Europe. These statistics point to the assumption that driving safety is often at its lowest in underdeveloped and unprogressive countries, mainly because laws, regulations and drivers education are not enforced. Let’s take a closer look at one of the safest places to drive in the world – Germany. Why is this particular country one of the safest places to drive? Well, driver training in Germany is much more extensive than that of many other countries, especially the United States. To obtain a basic license, you have to tackle a long process that requires the completion of registration, theory classes, special lessons, a theoretical test, a practice test and final behind the wheel exams. Do you remember spending this much time to obtain a driver’s license in the US? These extensive lessons are necessary to ensure that training includes practice on motorways, country roads and various conditions, including nighttime driving. This lengthy and simulated learning process helps drivers experience all types of driving conditions to gain valuable and relevant experience with an instructor, before the student driver is permitted to be out on their own. Germany also keeps the roads safe with strict rules, including rigorous vehicle inspections, mandatory third-party liability coverage and a point system that helps keeps dangerous drivers off the road. All cars are forced to carry safety and first-aid equipment and additionally must switch to snow tires in the winter. These laws are strictly enforced and drivers may receive harsh penalties if the rules of the road are not followed! Compared to Germany (and most countries in Europe) drivers in the United States spend significantly less money and time on driver’s education; and consequently, encounters the highest number of traffic related deaths. Learning to drive in Germany is a rather costly process. The price to obtain a license in Germany is around €1,400 to €2,000 Euros (US $1,850- $3,400), while in the United States, the average teen driver pays a total of $250 to $400 for their driver training. Although the process of obtaining a driver’s license is much more costly in Germany, people receive more training, preparation and hands on experience that results in safer roads and fewer fatalities. Driver’s education is taken very seriously because motor vehicles are not only a form of transportation, but can also be considered a weapon if inexperienced and unskilled drivers use them incorrectly. Most autobahns in Germany have posted speed limits and even “dynamic speed limits” that adjust to match traffic and weather conditions. However, when there is no posted speed limit, a driver may drive as fast as they wish, as long as they can maintain full control of their vehicle. But, why is speeding such a larger problem in the United States than in Germany? Well, drivers in Germany receive a large amount of experience and training under various road conditions, which gives them better control and understanding of how to manipulate their vehicle. Speeding is a large issue in the United States mainly because drivers are not trained to drive in hazardous situations at different speeds. The combination of speed and inexperience is deadly. The number one killer of American teens is motor vehicle crashes. Perhaps you are now asking yourself, “Hey, if the United States is such a developed country, then how do they not have the latest training techniques when it comes to driving?” Well, teenagers in most of the United States are only required to complete a written exam, a vision exam and six hours of behind the wheel training. Some states have a required number of additional practice hours that the teens must complete with a parent/guardian or experienced driver in the vehicle, but that is far from consistent and rarely enforced. Clearly, US driver’s need more training and practice, but this has not been enough of a priority. Experience is the solution to the growing problem of dangerous driving. Drive Safer is here to help drivers gain the skills and knowledge they need to become more developed drivers. If interested in learning more about how to stay safe behind the wheel of your own vehicle, check out one of our car control and defensive driving courses and learn important tips from high-performance driving instructors. The image above shows the 25 safest countries in green and 25 most dangerous in red.